For the past several months, the very thought of riding H’Appy brought about much trepidation. Bringing him in from the field was never an issue, much unlike his predecessor who hid behind trees on the regular, but once in the cross ties a fight to keep all my appendages in functioning order and attached to my body would ensue. He would paw. He would eat the cross ties. He would whip that big orange head of his around and try to bite me. He would weave side to side trying to squash me against the wall. He would try to step on me. Tightening up the girth was an adventure always leading to pinned ears, angry faces and homicidal ideations on his part. You can imagine how that set the tone for what was to come on both our parts. Don’t listen to her! She is telling lies!! Lies I say! Last night was the perfect night to ride. The day had been sunny, warm and dry. The arena is still partly under water from the deluge earlier this week, but it was workable. I wanted to ride. It gave me pause though because the timing was not right. I’d have to bring them in for dinner and let the others out while I tacked him up. Or I could bring only him in and tack up before feeding but then the others would be hanging by the gate. The last time they did that, H’Appy started rearing in the cross ties so bad I threw him in his stall. But I wanted to ride and a quick check of the weather showed rain today through the weekend. This would be my only chance this week and Hubby had agreed to cook dinner so I could ride. I drew in a deep breath, changed into riding clothes, grabbed his halter and decided I was not going to tip toe around his schedule. I was going to ride. I told the hubby to take a video and I’d grab stills, but he didn’t remember so you get blurry pictures in the dark again. And you know what? He came up to me in the pasture and led in quietly. He stood int he cross ties while Gem and Pete stared into the barn feeling starved and deprived. He let me brush him all over with a cocked hind leg. I grabbed the saddle and he looked at me, but didn’t move. I tightened the girth and saw nary an ear flick in my direction. We waked off to the arena, through the gate and past his friends, and he never once planted his feet, pinned his ears or tried to eat me. This was the third ride in a row where he was a GOOD BOY. This one turned out really good though! I went into this ride wanting to work on the canter. I hate the canter. 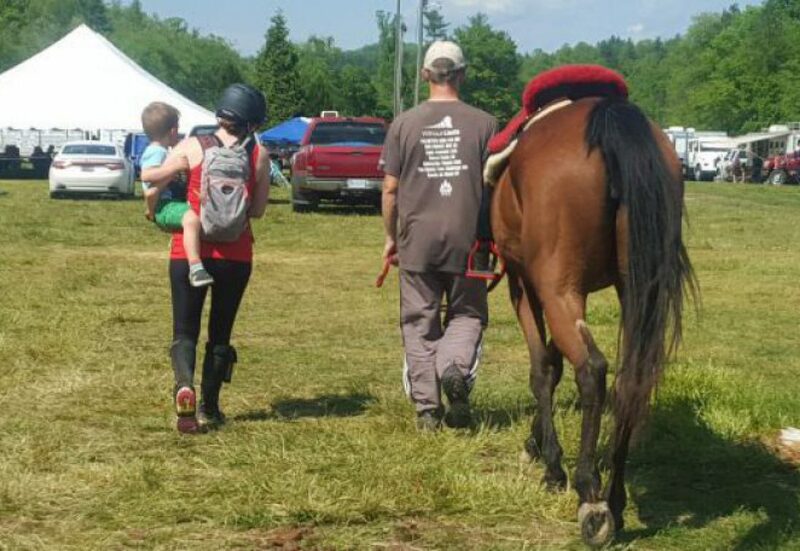 My entire riding life has lived in the trot and I am very comfortable there at 12 mph flying down twisting, single track trails, up and down hills and over streams. I’m not so comfortable at a 6 mph canter in a flat arena. Time to fix that. He was already in a listening mood, so I worked a while at the walk to loosen us both up and working really hard on my seat. My seat has two modes: rigidly braced and loosely driving. Neither are good. I really want to correct this and focus on a light, following seat at all gaits so that I am more neutral in the saddle unless I am asking for something instead of either blocking or yelling. So at the walk, I really concentrated on this. I’ve gotten pretty good at not being rigid and braced at the walk, but it has recently swung to me trying to move for him and that drives us both crazy. Last night I really allowed my hips and lower back to relax while sitting tall and sucking my navel in and just moving with him. Canter zoomies…go fast…but hey at least I have proof that I look up and look at that hind leg reaching under him. If he was being ridden by someone who knew how to ride, he’d be a pretty fancy little chunk. This will be super shocking to you all, so brace yourselves here. By doing this, H’Appy gave me a wonderful forward, marching walk that was in front of my leg without me forcing it and he even began to stretch down into the contact. It was a baby stretch down, but man did it feel good! I completely messed it up by not having contact to reach into, but baby steps here folks. He is trying to reach for a contact that isn’t there. Sorry, buddy! On the plus, my leg is actually beneath me instead of lock kneed and toes in front of his shoulder. Progress! After a brief trot tour to see how he was going to react to transition work, a bit of head tossing but nothing major, and it was on to the work of the night: the canter. His canter button is really amazing. Sitting a few steps of the trot, bringing my heel ever so slightly back and a light graze on his side and he is off! I focused hard on having a quality trot before asking for the canter and some times managed it and sometimes not. Over all though he was ok. I forgot to steer the first few times and ended up nearly plowing into the arena fence, but he was game to keep trying. I worked him left and then right concentrating on forcing myself to sit deep in the saddle versus being braced and rising ever so slight out of the saddle, lowering my hands that want to come up to my chin, letting my legs hand loosely but on so as not to nag him…oh and that whole steering thing. I think I’ll keep him. He may not think the same about me, but such is the lot of a horse. I’d give myself a B- overall. Nothing horrendous happened, we picked up the correct lead every time, and I managed to keep his flubby body in the canter until I asked to trot at which point he told me to screw off and halted instead. Steering needs a lot of work. Sitting deep needs a lot of work. Not letting him plow onto the forehand or go flying off into the distance needs a lot of work. But I kept my head screwed on, thought about my position, planned somewhat ahead on my track of progression and had fun. He has really relaxed lately. The saddle and girth help a ton, his feet are getting better and better and the consistently is icing on that cake. great job and yay I hate to canter too and if had my druthers would never canter again (except on cross country for some reason it does not bother me out there, go figure). You look great he looks great and everything will come with time!! Glad he has been behaving…!! keep it up H’appy! It really is! Banking good experiences has been helping me feel more comfortable pushing him. Like last night when he decided life was too hard and it was easier to just quit. I felt ok pushing him back into the canter knowing he would fuss a little but it was ok. He acts like a big dog at times. A big goofy golden retriever. The routine is definitely helping a lot. He is super wimpy and not afraid to tell me when he doesn’t like something so I think the saddle and girth combo along with his feet feeling good is making the most difference. It’s been really enjoyable to work on more than not dieing. I give you an A+. It’s so much more important to make progress and be self-aware, rather than just be perfect. This is growth. This is achievement. That’s what it’s all about. Growth feels pretty darn good. The biggest thing I’m working on behind the scenes is making my brain function while riding. Keep up the good work! The regular rides seem to really be helping both of you. This is excellent. I love that you are finding the joy again.